Previously this species had been classified in either the genus Aganais de Boisduval or Psephea Billberg, both of which are now regarded as junior synonyms of Asota (Vari, Kroon & Kruger 2002). 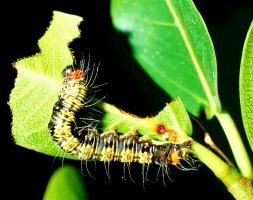 Caterpillar of Asota speciosa feeding on Ficus bizanae. Photo © Simon van Noort (Iziko). 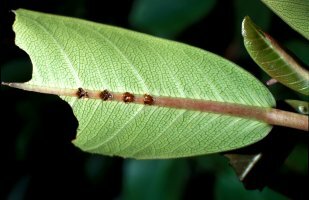 Latex sabotage of fig leaf (Ficus burkei) by caterpillar of Asota speciosa. Photo © Simon van Noort (Iziko). 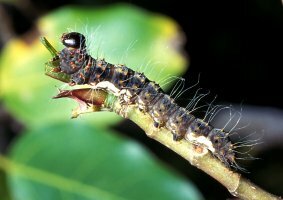 Caterpillar of Asota speciosa feeding on Ficus burkei. Note sabotage at leaf base. Photo © Simon van Noort (Iziko). 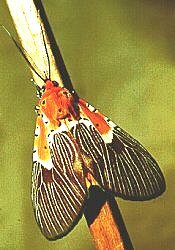 Adult moth of Asota speciosa. Photo © Simon van Noort (Iziko). Caterpillars of Asota speciosa feed on fig trees (Ficus species), which have a sticky milky latex that poses both physical (gumming up the caterpillar's mouth parts) and chemical hinderances for herbivores. Large caterpillars sabotage the latex flow by chewing into the leaf veins on the underside of the leaf (where these veins are more prominent than on the upper surface). This action interupts the flow of latex. The caterpillar then feeds on the parts of the leaf that would have been provided with latex via the sabotaged veins. Photo by H. O'Heffernan, © Iziko. COMPTON, S.G. 1987. Aganais speciosa and Danaus chrysippus (Lepidoptera) sabotage the latex defences of their host plants. Ecological Entomology 12: 115-118. VÁRI, L., KROON, D.M., & KRÜGER, M. 2002. 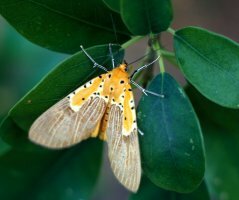 Classification and checklist of the species of Lepidoptera recorded in southern Africa. Simple Solutions, Chatswood Australia.